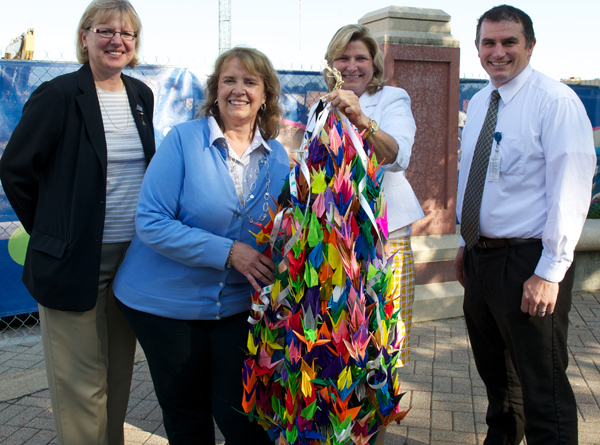 Over the past year, Akron Children’s construction team folded 1,000 origami cranes to signify hope and community. The cranes will be displayed at Peace Memorial Park in Hiroshima. Pictured L-R: Marge Zezulewicz of Hasenstab Architects; Sherry Valentine, an Akron Children’s deployment leader; Grace Wakulchik, COO; and Scott Radcliff of Hasenstab Architects. As massive, steel cranes dominate Akron’s skyline to construct the new building, cranes of a far more delicate sort have been rising up as well. While planning and beginning construction, the design team took on a team-building exercise to fold 1,000 origami paper cranes. Their efforts culminated recently into a breathtaking bouquet of color, camaraderie and compassion. The goal was to fold 1,000 cranes to send to the Children’s Peace Monument, also known as the Tower of 1,000 Cranes, in Hiroshima, Japan. “We were looking for a way to connect the building team to a story of compassion, and we thought of this wonderful story of Sadako Sasaki,” said Norio Tsuchiya, vice president of HKS Inc. in Dallas, which is helping manage the building project. A survivor of the bombing of Hiroshima during World War II, Sadako was diagnosed with leukemia in 1954 as a sixth-grader. She began folding paper cranes in observance of the Japanese tradition that a wish will be granted upon folding 1,000 cranes. She wished for healing and peace. Sadly, Sadako died and fell short of her goal, but galvanized her community. They picked up on her cause and eventually built the Peace Memorial Park. Today, people and groups from around the world send batches of 1,000 cranes as a sign of their common wishes for peace and healing. Tsuchiya suggested to Grace Wakulchik, chief operating officer for Akron Children’s, that the construction team could produce 1,000 cranes during the course of their construction planning. So during those odd, trapped moments of downtime that are inevitable in group work, team members began folding. As various engineers, architects, contractors, medical staff, support staff and others passed through the room, they had an opportunity to contribute to the crane-folding cause. 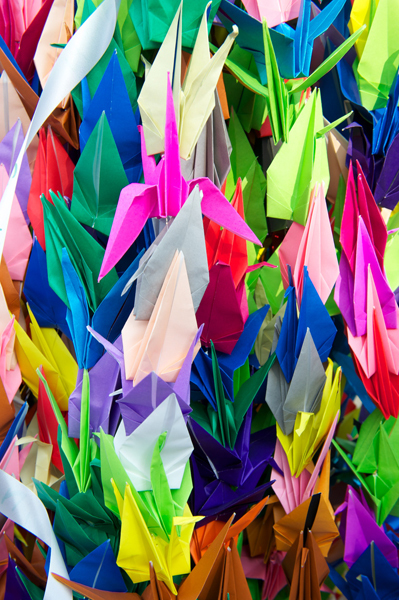 It took a little more than a year for a hundred or more people to fold the 1,000 cranes. In August, they sent their cranes to be displayed among thousands more at Peace Memorial Park.